Despite all the attention on Toyota’s plain Jane but reliable Corolla and Camry sedans, Toyota did actually have a reputation for making affordable sports cars. Reputable examples of this are the Supra, Celica, and the MR2. 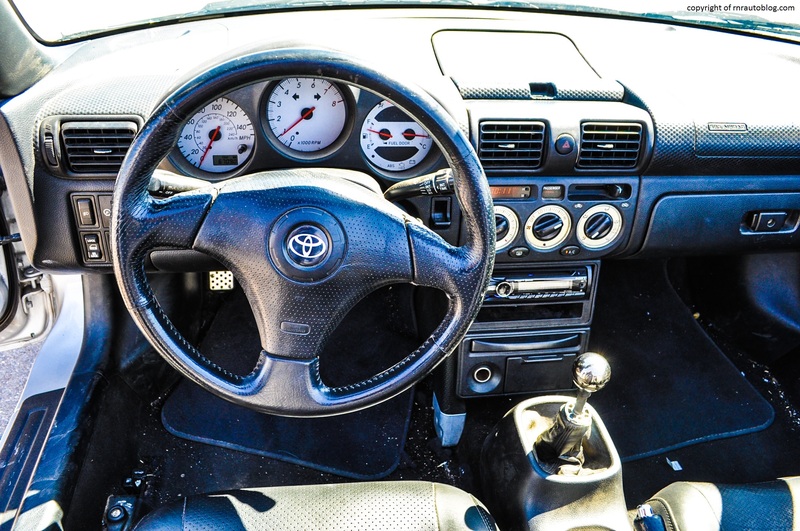 In 1976, Toyota came up with a proposal for a vehicle that placed an emphasis on driving dynamics while providing typical Toyota virtues such as reliability, affordability, and fuel efficiency. Akio Yashida, the man behind the original MR2 decided on a mid-engine configuration for optimal handling balance. A company known for its practical and ordinary cars, the 1984 MR2 proved that Toyota could make fun and affordable sports cars. 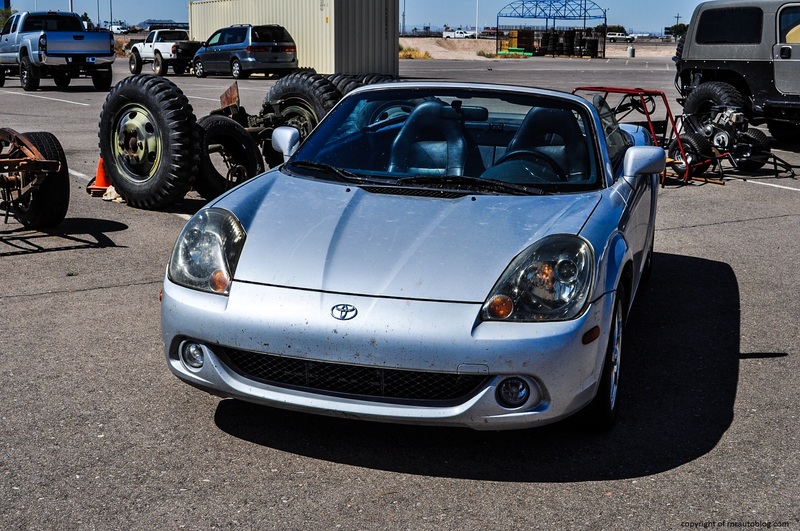 Even though it was powered by small engines, the MR2’s sub 2,500 pounds curb weight gave it unbeatable balance and go kart reflexes. 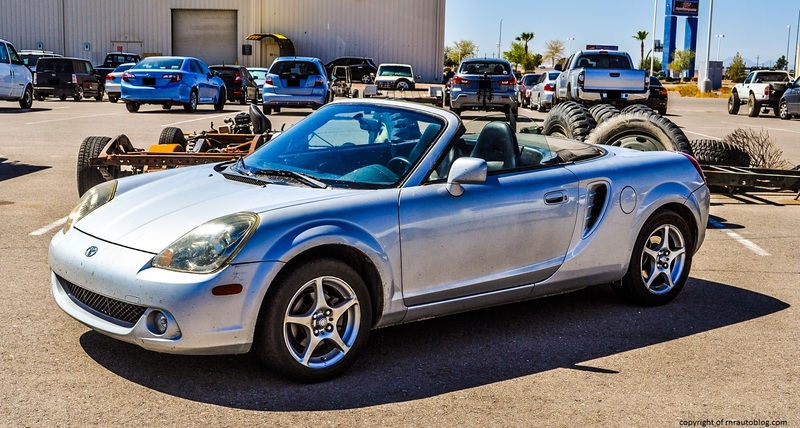 Combine the legendary handling with typically Toyota quality and reliability as well as affordability, and the first generation MR2 would become one of Toyota’s greatest cars ever made. My friend’s mom who currently drives a Mercedes C250 Coupe told me her first car was a supercharged 1988 MR2 five speed. 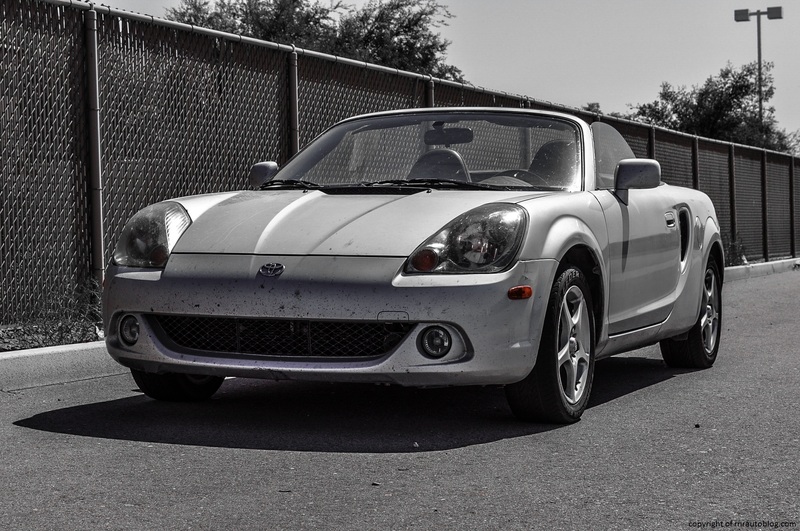 Even though she has had some sweet cars over the years as well as four Mercedes-Benzes, she still claims the MR2 was the best car she ever had, and would buy another one if Toyota still produced them. The MR2 was redesigned in 1989 (North America got the second MR2 in late 1990 as a 1991 model year car). In contrast to the first generation’s angular styling, the second featured curvier and shapely styling. 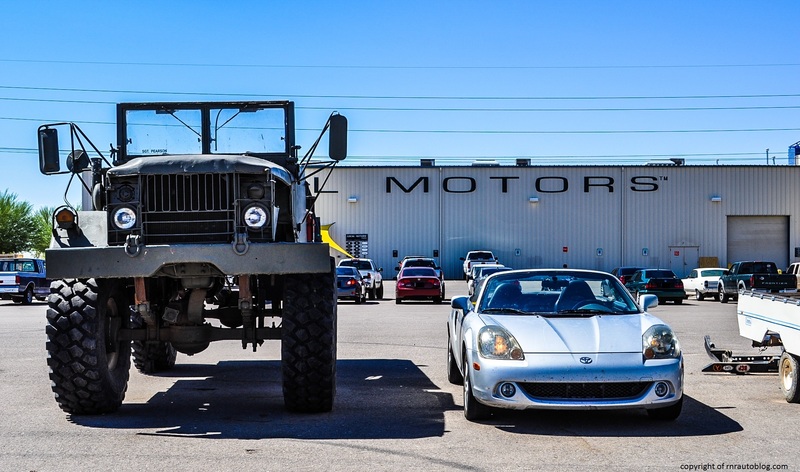 The second MR2 also gained weight significantly and horsepower was increased. 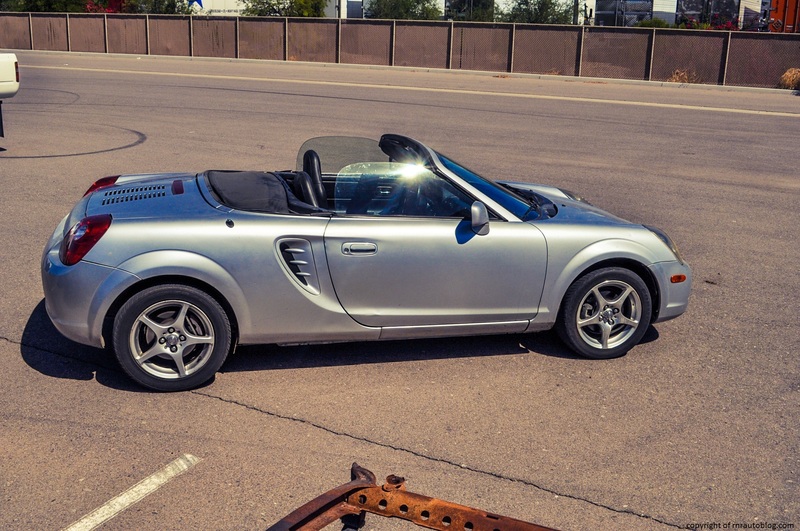 While it was commercially successful, MR2 purists did not like it as much as the first due to the loss of delicate handling as an effect of the increased curb weight. 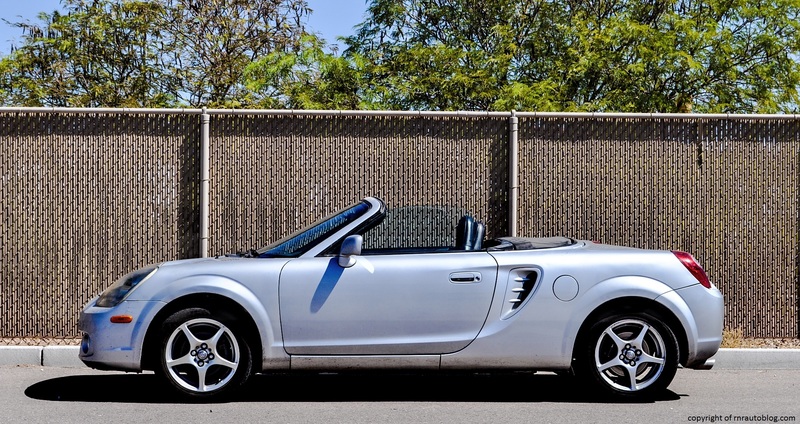 In 1999, Toyota redesigned the MR2, bringing it closer to the weight of the first generation, and coined its moniker, MR2 Spyder. 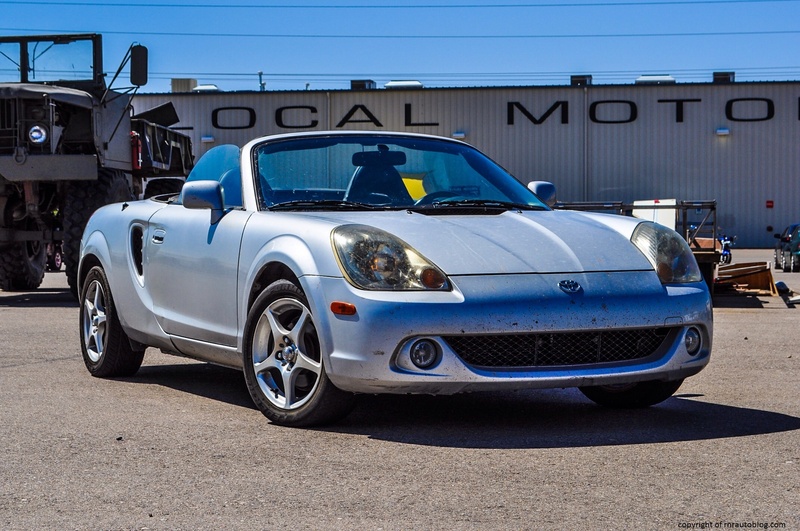 Sadly, Toyota discontinued the MR2 Spyder in 2007 (2005 in North America). 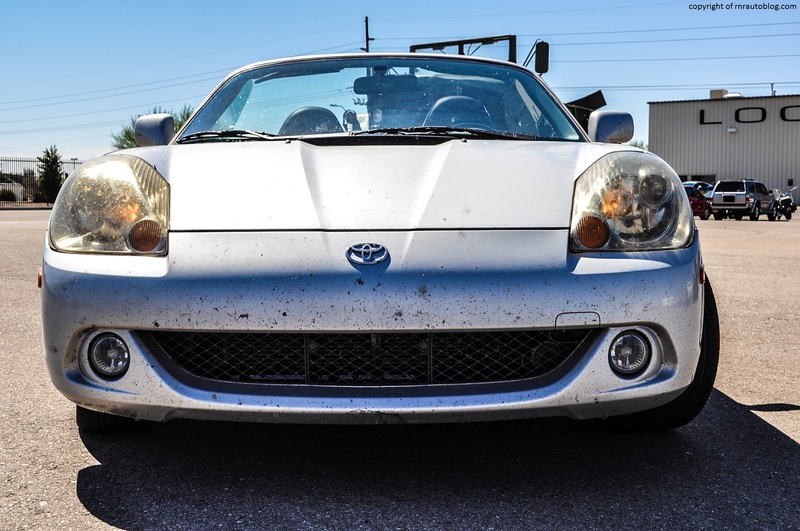 At first glance, the MR2 literally looks like a bug eyed creature. 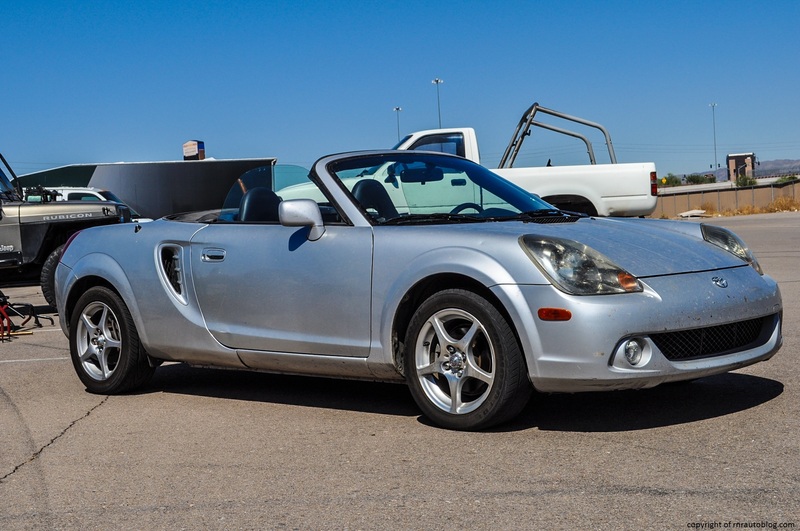 The rather large headlights and the slab sided fascia don’t exactly make the MR2 a sight to behold. However, it does look purposeful. The whole car looks like it has been designed with a machete. It is chiseled, and this is evident in the side. The side profile embodies lightness and athleticism which is reinforced with slightly bulging fender flares and a detailed vent behind the door handle. The rear is slightly more interesting than the front although it features ordinary taillights. The exhaust sticks out awkwardly, but I do like the mesh embedded in the bumper and in the space between the taillights. The interior is very utilitarian, although the material used for the steering wheel and the dash do lend a sporting feel to the interior. I am not exaggerating when I say this is one of the best cars I have driven. This car is extremely light at 2,195 lbs. Just to put that in perspective, Toyota’s smallest North American model, the Yaris, weighs around 2,300 pounds. 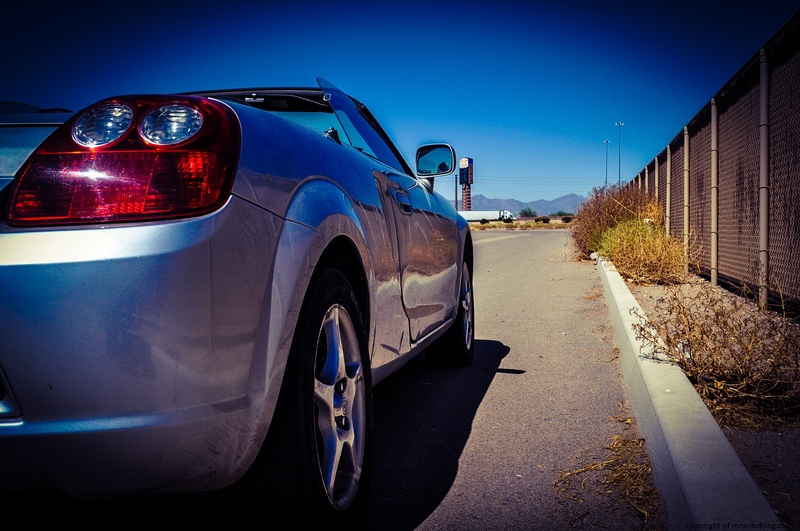 The low curb weight is evident from behind the wheel. The steering operates with a surgical precision that is to be believed. Turn the wheel a little, and the car will turn a lot. The steering is heavier than I expected, given the car’s small size, but it made piloting this little thing more entertaining. While more road feel would not hurt, the weighting and precision are spot on. 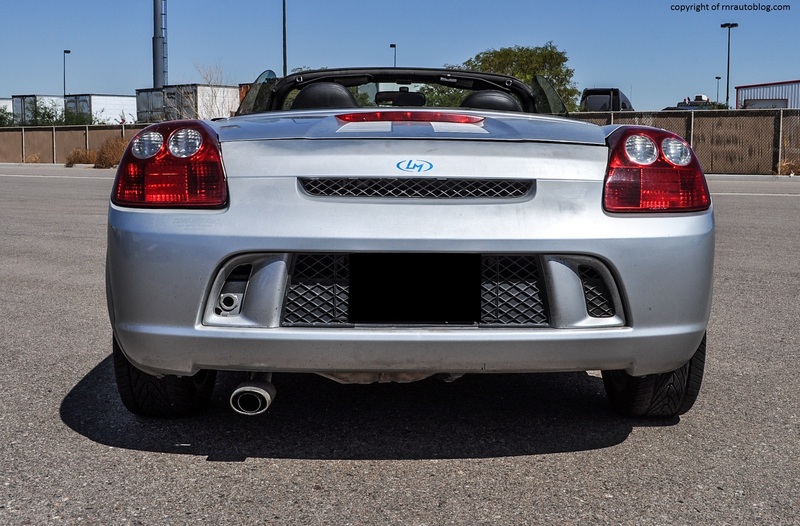 The mid engine configuration enables the MR2 to display high levels of agility as cornering at high speeds does not induce noticeable body lean or understeer. I drove the MR2 hard into corners, expecting it to plow straight ahead, but no such luck. It simply regains its composure, and turning fast becomes addicting. 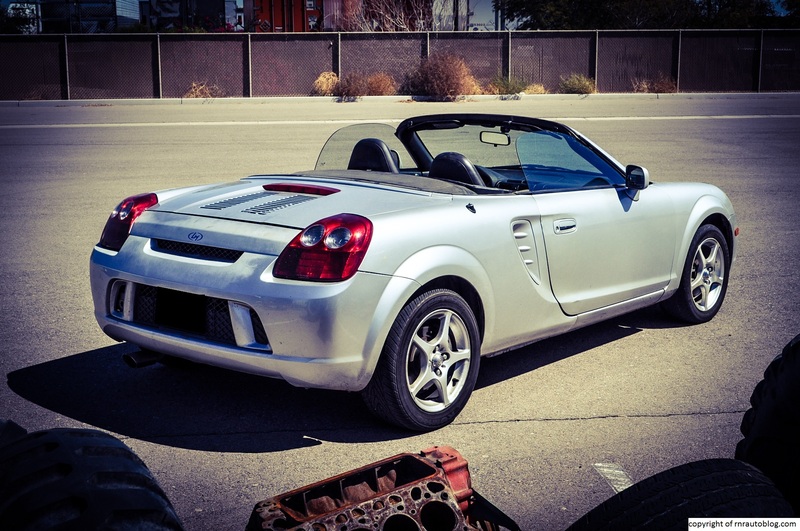 This car gives you delusions of grandeur; you feel like a race car driver in the MR2. With excellent brakes and the sharp handling, it displays characteristics of a race car. The way the MR2 remains graceful no matter how hard you push it is to be believed, and not only that, it entices you to drive it even harder. Before you know it, you wonder how people could live without a car. Make no mistake about it; it is a truly involving driver’s car. However, there is a price to pay for the superb handling; a rough ride. The stiff chassis means that you will have to endure a car that fidgets uncontrollably no matter how smooth the road is. 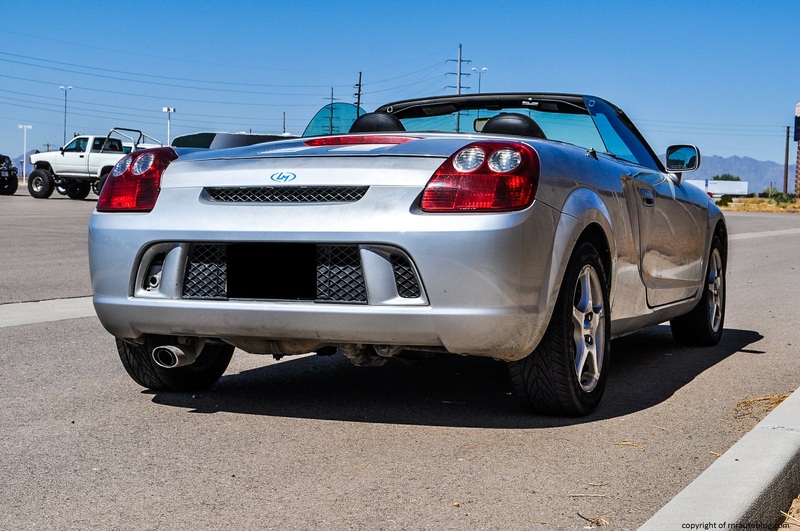 If you are into horsepower, you would be quick to dismiss the MR2 as a sports car under the belief that sports cars have to be powerful. The only powerplant for this generation was…wait for it…a 1.8 liter four cylinder carried over from the Corolla. And the horsepower and torque? 138 horsepower and 130 lbs. of torque. 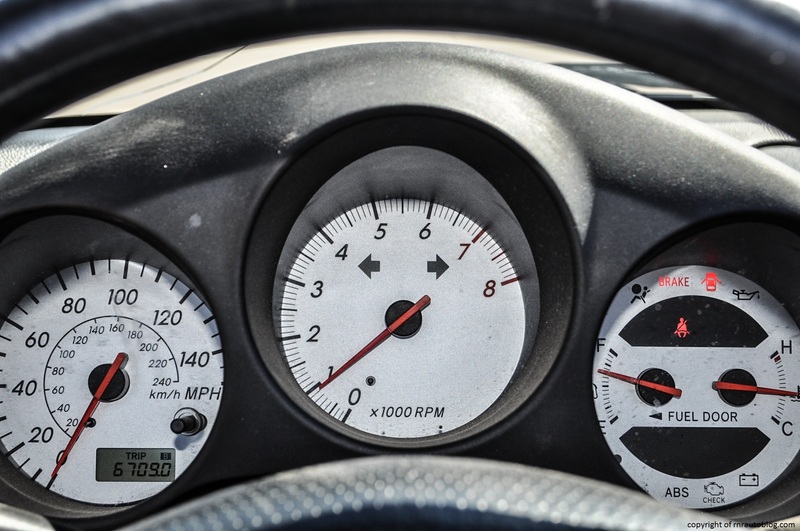 Not exactly fast, but the MR2 accelerates quickly thanks to its low weight, with 0-60 mph done in less than seven seconds. The four cylinder is a little wheezy; at low revs, it feels flat, but it packs a decent mid-range punch, and then it pulls strongly to the end of its power-band. 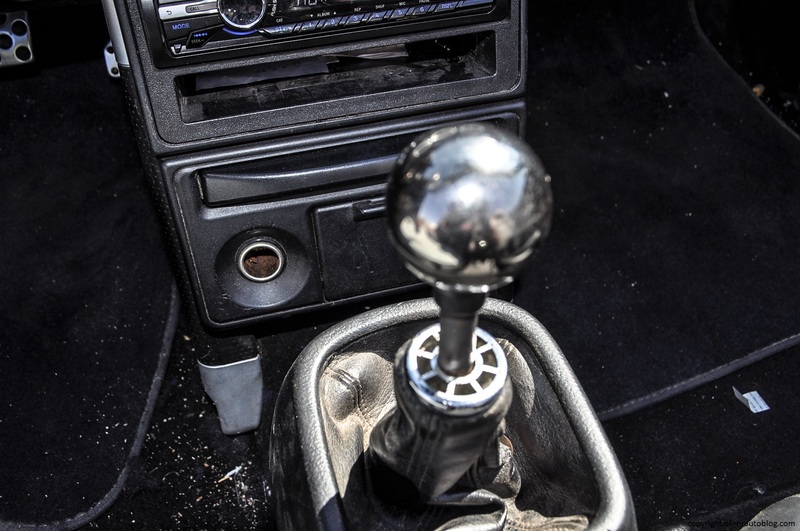 With short throws and a slightly heavy shifter, the five speed manual is a joy to use. 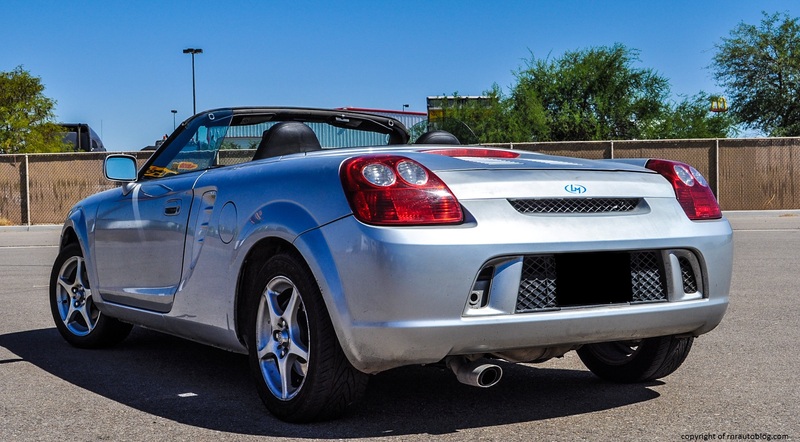 With good feel and weight, the clutch makes driving this car easy. Fuel economy was excellent as well, with fuel economy around 30 mpg overall. If you value a quiet cabin, then this is not the car for you. At speed with the top up, the cabin is filled with racket. There is tire roar, wind whooshes, and the engine is buzzy. The engine does not sound particularly refined, especially if you floor it. As per Toyota’s standards, the interior is well assembled. However, there are some cheap feeling surfaces, and some buttons feel insubstantial. The cup holders are virtually unusable and not very sturdy. Finding a driving position is easy as the steering wheel and the seat feel right. I would not call the cabin roomy as this is a small two seater sports car. Headroom is so-so, but legroom is lacking, and the seat does not have much room to push behind. Storage space is a joke; if you want somewhere to place your phone or your pen or such, you’re out of luck as there are no cubbies or compartments. 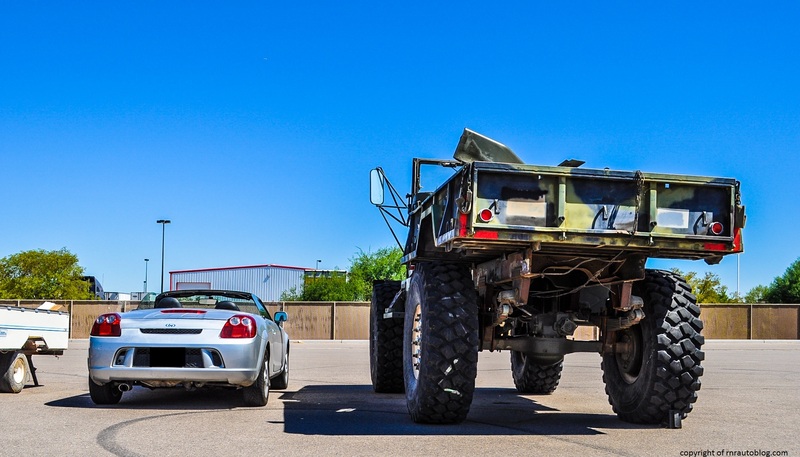 As for trunk space…there is no trunk. That’s right, this is the first car that I have reviewed that does not feature a trunk. I suppose Toyota thought that if you needed to put a suitcase or a backpack, the passenger seat would be ideal. 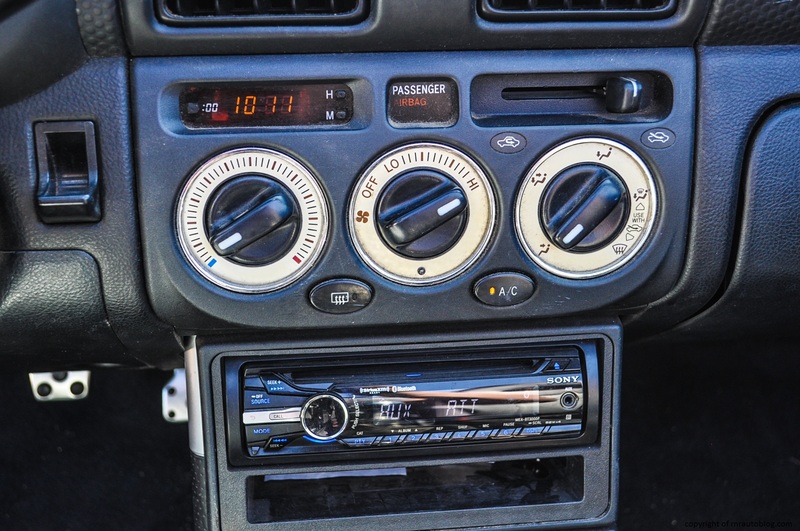 The controls are simple, and the knobs for the air conditioning work well, and the gauges are legible. Access is a bit tricky as you don’t really exit out of the car gracefully, but in a car as fun as this, that’s a small price to pay. Even though the MR2 lacks a trunk, and it features noise levels as high as a rock concert, I am in love with this car. I am not exaggerating when I say I never had so much fun driving in circles in a parking lot in this car. Sure I might have garnered glares from strangers, but I do not care. I felt like a kid in a candy store in this car. This car reminds me of happy days when Toyota and direct quote from my friend Miranda “had their s*** together”. Instead of focusing on how to make their core products sportier and less comfortable (like the Corolla and the Camry), Toyota actually reserved the sporty and handling know-how for actual sports cars like the Celica, Supra, and the MR2. It is kinda sad how no matter how hard Toyota tries to spice up its current lineup (Swagger Minivan anyone? No really. That’s what Toyota calls its Sienna minivan), they still cannot provide us with true sports cars. Even the Toyota GT86 sold overseas is a Scion in America. With that said, the MR2 convinces me that Toyota needs to bring back great cars like the MR2. The MR2 is an unbelievably fun to drive machine. I don’t think it is possible to be sad in this car, and with the combination of Toyota reliability and fuel efficiency, it is a winner. 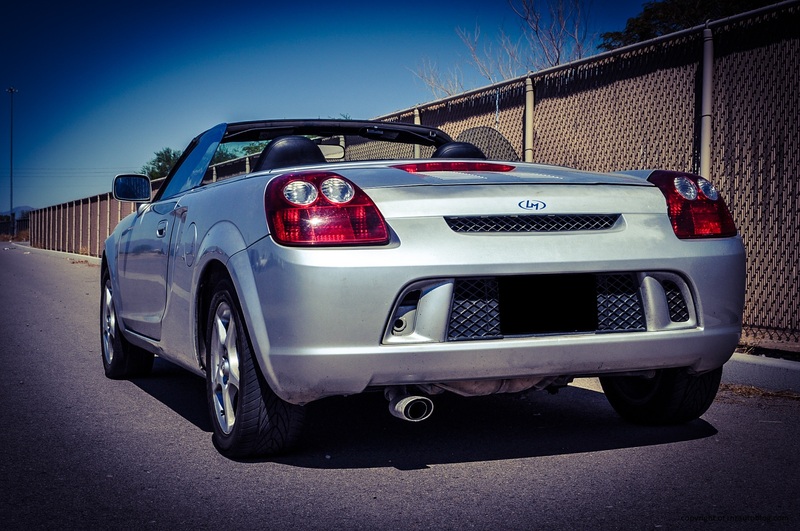 I have decided that this is the third best car I have reviewed on this blog. The Acura NSX remains the best, and the Nissan GT-R is a close second, but the MR2 is definitely the third best. The fact that the MR2 is almost as good as a Nissan GT-R and an Acura NSX is evidence of how much I like this car.